The growth of Lisburn had begun. 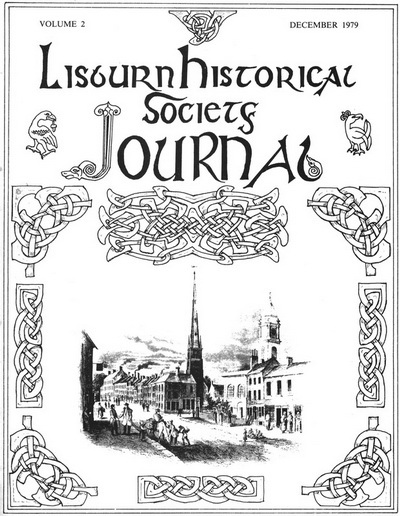 THE SECOND VOLUME of Lisburn Historical Society Journal comes with note taken of advice and criticism and I trust that the readers will find it interesting. Frederick Kee, a founder member of the Society, has not been able to contribute this year due to illness, but I look forward to articles from him next year. It is with sadness and regret that I record that two members of the Society passed away in September and October - Miss A. Bullick and the Reverend J. B. Lowe. The proposed Borough Museum is starting to take shape under the direction of Mr. B. Mackay who was appointed in June as Curator. The Society's Collection is helping to form the basis for the Museum. There have been some gifts from well-wishers and it is hoped that as more people become aware of the project, more will come. Many museums have a body associated with them called the `Friends of the Museum', this I feel already exists in Lisburn in the Society and possibly this aspect might be developed within the Society's framework in the near future. Grateful acknowledgement is made to the Lisburn Arts Advisory Committee in their financial assistance towards this publication. Finally, two centenaries -in 1979 we commemorate the centenary of the birth of the Hillsborough musician, Sir Hamilton Harty. Next year 1980, sees the centenary commemoration of the founding of the Lisburn Intermediate School, now Wallace High School. The cover was designed by William Parkes with the engraving of Lisburn circa 1830 as its centrepiece.